Last month, hundreds of students from Connecticut’s public institutions of higher education converged at the state capital to testify before the Legislature’s Appropriations Committee about the importance of higher education in their lives. One the most moving speakers was Bobby Berriault of New Britain, a 2014 graduate of CCSU. Berriault, 29, was the last person to testify at the Feb. 15 hearing and, like the other students, spoke out against proposed cuts in higher education funding by the state. Berriault grew up in poverty, living in five foster homes and two group homes. He went to Asnuntuck Community College before transferring to CCSU. The school was the only one he could afford to attend at the time, he told lawmakers. Berriault is scheduled to graduate from Western New England University with a law degree in May. He will attend UConn Law School in September, where he will pursue a master’s degree in Human Rights and Social Justice law. CSCU President Mark Ojakian, who also testified at the hearing, said the testimonials exemplified the grit, determination, and drive possessed by CSCU students. Since FY 2015, state appropriations have been reduced by $61 million, or 17.6 percent. The system also faces $24 million in additional fringe benefits costs. 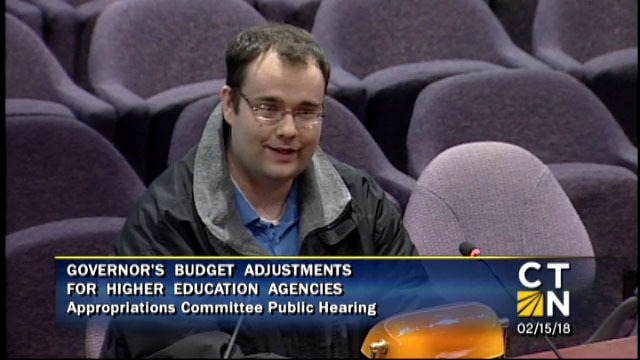 Berriault urged lawmakers to consider the impact continued cuts will have on students like him. Even once affordable community colleges are becoming out of reach for some people. Watch his testimony in the video below.